In the game of Celebrity Head you wear a headband. In that headband there is the name of a celebrity. On your turn you get to spin the spinner. Possible spaces to land on include big hint, ask a question, ask two questions, or lose a turn. Ask questions to find out more about yourself. Questions must be asked in the yes/no form. The first player to figure out who they are and make the correct guess wins the game. Check out Celebrity Head for a fun game that will have you searching your brain for the all the celebrity's, past and present, that you can think of. Good luck figuring out who you are before your opponents can! Hidden in your headband is your celebrity name. 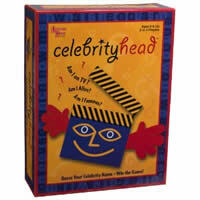 The goal is to guess your celebrity name first and win the game of Celebrity Head. Your Celebrity Head game should come with game board, four headbands, 70 Celebrity Name cards, 10 Blank cards, 20 Big Hint cards, spinner, and the Celebrity Head rules and instructions. Please keep in mind that the official Celebrity Head party rules and instructions could be different depending on the game version you have. The rules below are some of the exact directions on how to play Celebrity Head. Share with us your comments, funny stories, tips, advice, strategies, creative ways to play, questions about how to play, problems with the rules or anything you want about Celebrity Head. All submissions will be reviewed within 24 hours. Click here to add your Celebrity Head comments. How can I order this game please.